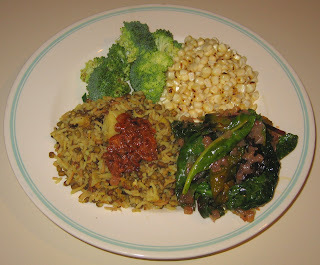 A few days ago, my wife made khichri, a common South Asian dish of lentils and rice. I reheated her leftovers and served topped with lime pickle. I also made some braising greens. I started probably with too much onion - I used my new onion chopper to finely chop a medium onion and started the onion sauteeing in tangerine olive oil over medium heat for 4 or 5 minutes (if I weren't going to use my new chopper, I would have preferred a half onion cut into half moons for the texture). Then I added the mixed greens and a little salt, and cooked the greens down for another 4 or 5 minutes. Then I mixed in a single serve packet of green chile from 505 Southwestern, a little red chile powder for good measure, and maybe 1/2 teaspoonful of tarragon. Yesterday was the last class of my six-week photography series - I actually have a new series beginning next Thursday (and another new one on Wednesdays in another town). A group of eight of us, including several of my students, my wife, and two friends, dined at one of our favorite Italian restaurants, Cafe Trilussa. The owner-chef of this small restaurant is fun to talk with - he knows what vegan means, so when I go, I give him free reign and tell him a price ($15 per person) and ask him to make what he likes for us to enjoy family-style. We had I think 4 or 5 dishes, including one curried vegetable dish, paella, risotto, salad, and one or two additional items - good! I won't likely be making any blog entries till early next week. Tomorrow, there is a potluck and talk on Judaism and vegetarianism. My wife's sitar teacher from India is visiting for the weekend and is performing a concert on Sunday; we have food donated for the musicians from Sitar Indian Restaurant, and my wife will probably purchase additional food for us from there. We may be going to a movie on Monday and eating out near the theatre. Best wishes! I had a meeting with a bride-to-be / potential client at 5:30p, then interviewed a family for participation in Servas, and didn't get home till after 9p. My wife said that she would eat on her own, and ate with my parents. I was hungry and realized that we still had some leftovers from the wedding we had recently gone to. 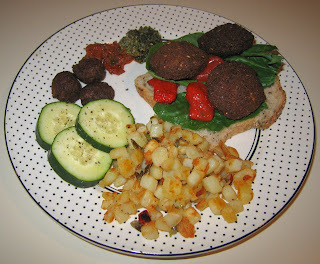 I heated the falafel and (non-soy as I recall - vegan, certainly) vegan "meatballs" with yummy pesto and tomato dips. I made potatoes O'Brien from a frozen package, sliced some cucumbers, and had a fast and good meal! There are a number of theories why strozzapreti pasta is named as a "priest choker" pasta, such as that priests in Italy would gorge themselves on these rolled towel shaped pasta pieces and choke. Be that as it may, I prepared a simple but good dinner with this pasta. A friend yesterday gave me chives from her garden, and most of them became an important part of today's meal. I took all but two stalks from a bunch of fresh spinach, washed it well, then roughly hand shred it into fourths or fifths and threw the spinach into a saute pan with some olive oil. After all the spinach was shredded and cooking, I cut up about 2/3 of a yellow bell pepper into 1/4"-1/2" pieces, and added them to the pan. I cooked the spinach down for maybe 4 or 5 minutes, then added about a half dozen chives, cut into inch-long pieces, and cooked for maybe two more minutes. 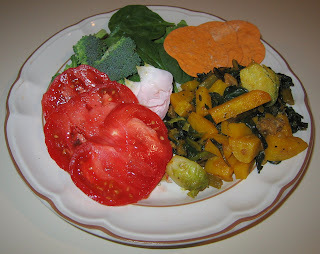 I served the spinach mixture, after adding a little salt, and maybe a tablespoon of Eat in the Raw's Parma! vegan "Parmesan cheese", atop the pasta. 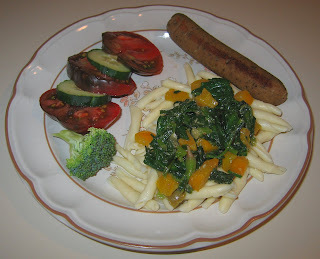 I also served some apple-sage vegan sausage (on sale right now, along with their field roast). Yesterday, dinner was disappointing. I enjoyed a bike ride with a friend, and my wife met us afterwards. We were going to enjoy some South Indian dosas (crepes) then go to see an intriguing-sounding film, Mio fratello è figlio unico (My Brother is an Only Child), about two brothers in 1960s and 1970s Italy who grow up with one becoming a communist and the other radically opposite, a fascist. Alas, the Indian restaurant was closed and we found ourselves with very little time before the film. We found a taquería - normally my wife hasn't found a liking to Mexican food and would pass, but we thought she could get at least a salad. We were surprised to find that the staff didn't speak English, so communicated our vegan (no, they don't cook with lard) needs and made our order by calling our friend who gave us the chives and who can speak Spanish, and having her be the go-between for our order. I had some tacos, which were okay - but my wife didn't at all care for her tacos. She and I may be on our own tomorrow for dinner. I am meeting a potential client to discuss her wedding photography needs, then going on to interview somebody for Servas, a world peace group that I am the state coordinator for. My wife has said that she'll make do with leftovers or will make something, and I will either eat late or eat something in between appointments. 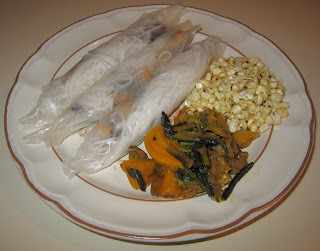 As I described last June, my blogger friend Puja had so kindly sent me Vietnamese rice paper (banh tranh) rolls. She loves them and I should experiment more with them. They keep well and today I used them again in an idea that I came up with. We ran out of time to go grocery shopping but had some tasty looking shiitake mushrooms. I sauteed the mushrooms and a little bit of onion in tangerine olive oil for a few minutes till the mushroom was cooked, then mixed in a little salt and black pepper, as well as some New Mexican chile sauce (I wish I had either time to make some peanut satay sauce or that had some on hand, but since neither was true, I would have no dipping sauce and tried to jazz up the mushrooms). I took out six (three for my wife and three for me) rice paper sheets and kept the filling - these mushrooms as well as some rice noodles that I had briefly boiled till cooked, then drained - handy. I took the rice paper discs in turn and put each in a shallow plate of hot tap water just 5-10 seconds or so, till just pliable, then added the mushroom mixture and noodles and folded into a roll. I served them with leftover beets from a few days ago and corn-off-the-cob. I enjoyed the meal, but my wife found the rolls too bland and actually had some ketchup with them when she didn't like some seasoning that I offered. I definitely want to return to the rice paper again in the near future, using some of my ideas from last June, such as avocado, as filling. On this first day of the long 3-day Memorial Day weekend, I served the leftover pizza from Tuesday, adding apple-sage vegan sausage and cubed yellow bell pepper. Like on Tuesday, I couldn't resist heating some tater tots, as well. I tried an idea for a salad that my wife ended up particularly enjoying. I used my to give the onion chopper to dice a zucchini (easy) as well as maybe a fifth of a medium Vidalia onion, and mixed the cut vegetables with kernels stripped from flame-roasted corn. I mixed in a little lime juice, maybe two teaspoons of pesto sauce, a little salt, and I think a few leaves of oregano. I want to give the Progressive brand onion chopper another try or two, and it helped me to make a unique dish tonight. I thought that I would make a simple side dish of shiitake mushrooms with tempeh, onion, and spinach. But, after dicing a medium Vidalia onion with the chopper, I thought I'd put tempeh in as well - it worked okay; I used about 2/3 of a tempeh cake and ran it through the chopper after first cutting it into about five chunks, each then chopped in turn. 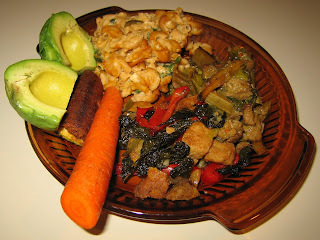 That gave me the idea to make a scrambled tempeh dish. 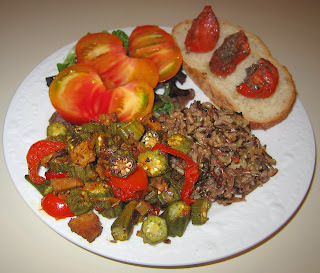 In November 2006, I had made a scrambled tempeh dish, but it was quite different, using salsa, other spices, cut much coarser, and was stuffed in squash. I put a seeded Anaheim pepper through the chopper, and it came out nicely chopped. I started the onion and tempeh sauteeing in tangerine olive oil over medium heat in my cast iron pan. Once the onion was clearing up and the tempeh getting a little brown, in maybe 6-7 minutes, I added the pepper and cooked for a few more minutes, mixing in a little salt and maybe 1/4 teaspoon of ginger powder, and, just before removing from the pan, 1/2 teaspoon or so of turmeric. I then took the scramble out of the pan and mixed in a little (maybe a tablespoon or so) vinegar-based organic hot sauce and served. It was good! I also served a prepared potato artichoke salad that I had purchased from Whole Foods. It ingredients were more or less red potato, artichoke, lemon zest, lemon juice, canola oil, and leek, as well as some cherry tomatoes. 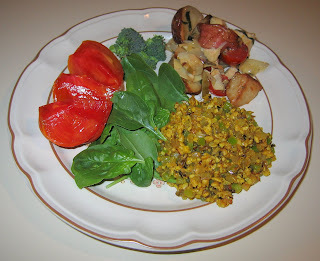 I heated it (except the tomatoes) mildly - it was good and a surprising combination that would be fun to make. By the way, yesterday my parents joined my wife, a few students, and me at Panzanella Restaurant in Carrboro after my photography class. I had my usual - a vegan pesto pizza. Yum! I had some grilled onion and artichoke on top, and as an appetizer, shared an arugula salad with beets and pine nuts. It's been a long time since I cooked with beets, so today I decided to make something similar to the Golden Beets with Brussels Sprouts that I had made last February, but chose a variation on my own suggestion to try this dish with seitan (primarily instead using a link of 1/4" cubes of apple sage vegan sausage), steamed the beets instead of cooking them, and for the first time opened and tried a new tangerine extra virgin olive oil that I brought back from the market at San Francisco's Ferry Building. The oil is made by crushing olives with tangerines by the Stonehouse California Olive Oil. According to the company's website, their 80-year-old olive trees are farmed organically in foothills just east of Chico at the edge of Table Mountain in Oroville, California. Oroville, incidentally, is where the "Mother Orange Tree", planted in 1856, is said to live and be the oldest orange tree in Northern California. Anyway, I steamed three golden beet roots for 40 minutes. I put them in cold water for a few minutes to let me handle them, then peeled them easily by hand - no peeler was needed. I cut the peeled beet roots into chunks approximately 1" long and 1/2" in width and depth. In the last 5 minutes of the steaming, I also tossed in a dozen Brussels sprouts. I had first removed a little from the tops and stripped the outermost leaves, then cutting each sprout in half. Today I made one of my very infrequent stops at the gourmet store A Southern Season, and was surprised that their annual June sale with most of the store at least 20% off had begun early - this very day. I picked up a Progressive brand onion chopper; I often dice onions and have been thinking of purchasing an aid. I tried it with a medium yellow onion, but didn't find it easy to use, requiring a lot of force and taking some time for washing, so likely will return it. In any case, when the steaming was almost done, I began sauteeing those onion pieces (diced into fine cubes less than 1/4" in size) till translucent, about 2-3 minutes, as well as a link of the vegan sausage and a little bit of leftover seitan, both chopped into 1/4" cubes. Then I added the beet leaf stems, cut into inch lengths, and let it all cook for 4 or 5 minutes. Then, I added the beets, Brussels sprouts, and about a tablespoon of rosemary needles; a few minutes later, I added the beet leaves, hand torn into approximately 1 1/2 inch squares. I cooked for about 2 or 3 more minutes, added a little Baja Lime marinade, salt, freshly ground pepper, a little bit of paprika, and a few pinches of tarragon. I served it with fresh spinach and broccoli, some organic rose petals (my Heritage David Austin rose), and Italian crackers. It was a good dinner! 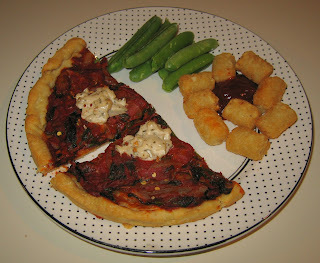 My wife has had a craving for spinach, so I thought of making a spinach pizza. 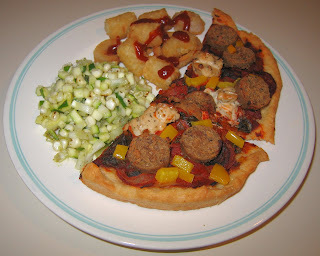 I used Vicolo Pizza organic cornmeal crust pizza shells; they come frozen in a pack of two. I simply sliced into thin half moons half of a sweet Vidalia onion and started sauteeing it over medium heat. After a few mintues when the onion was clearing in color, I put in several (three or four?) handfuls of baby spinach leaves, and cooked a few more minutes till the spinach was cooked and reduced a little in volume. I put the onion-spinach mixture into a bowl and mixed in half of a 12 ounce can of tomato puree, about ten oregano leaves from my garden, a tablespoonful (maybe a little bit more) of pesto sauce, and a little salt. I spread the sauce into two pizza shells and on my pizza (not my wife's as she avoids non-fermented soy) put a few heaps of Scottish garlic and herb vegan creamy "Sheese" spread. It was good! I also served some English peas and heated some tater tots (potato treats). We have some friends who are leaving town tomorrow or shortly thereafter; he just graduated from Duke Law School with a graduate degree and has accepted a job in the San Francisco Bay Area, while she is looking for a job as an architect there. My wife had to eat early and get to class, so she had leftovers on her own, but I prepared a late dinner to suit our friends' schedule - they couldn't make it over till almost 11p (no problem!). It's been a long time since I've enjoyed a Field Roast handmade stuffed vegan (with apples, squash, and mushrooms) Celebration Roast, and I picked one up (on sale) for tonight. It's easy to make and just needs heating in the oven. 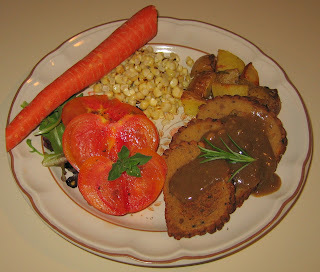 I sliced it and served it with Simply Organic brand vegetarian mushroom gravy (all organic vegan ingredients, including rice flour, mushroom, potato starch, yeast extract, carrot, garlic, and onion). I also roasted some Yukon Gold potatoes (cutting each small potato into eights, tossing with some olive oil, salt, and rosemary needles, and roasting in a 400° oven for 30-40 minutes till the potatoes were lightly browned, shaking once) and served corn-off-the-cob, mixed with a little salt, Earth Balance margarine, and lime. I sprinkled some alder smoked salt that I brought back from California last week, along with freshly ground black pepper, on some slices of heirloom tomatoes, as well. I've let my blog get behind and have to get caught up. I photographed a vegan wedding in Ohio on Saturday, leaving Friday morning to get to the rehearsal. We had rehearsal dinner at Carrabba's Italian Grill in Westlake, Ohio; they had one pasta without eggs and their pizza could be made vegan, so we had one of each - both were reasonable. On Sunday, a friend from Pittsburgh, 2 or 2 1/2 hours away, came to Cleveland to spend the evening with my wife and me; we went out to Tommy's in Cleveland Heights for dinner. I used to visit Cleveland periodically years ago and remember enjoying this restaurant. It is mostly vegetarian and serves (as I recall) very good falafel in a variety of forms. I had their tamales topped with salsa and seitan - good! There is a lot of countryside in the approximately nine-hour drive between Cleveland and my home in Durham (NC), and the best bet to stop for food seemed to be the capital of West Virginia, Charleston. I had found on the internet that there was an Indian restaurant there, Sitar of India. My wife was very disappointed, though I thought the food was passable; we shared a papadum (rather meager serving of a single papadum lentil cracker - my wife found that it tasted stale), salad, bhagan bharta (eggplant) that was probably the least interesting bhagan bharta I've ever had, and two flat breads, neither of which was good (my wife was tempted to ask if she could train the chef in cooking these breads!). We're so lucky to have so many good restaurants where we live! [Post 3 of 3 contiguous days done about a month late.] Finally, after our trip, I made a bit more complex and interesting meal. 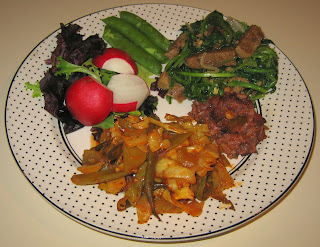 It was a jumble with okra, seitan, red bell peppers, and other vegetables. To keep the okra from getting gelatinous, I first cut the tops and bottoms off and steamed the rest for just a few minutes before sauteeing. [Post 2 of 3 contiguous days done a month late.] 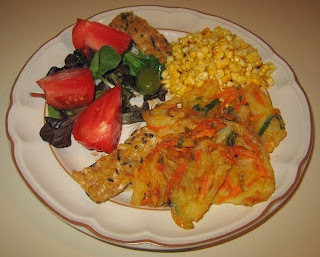 I made a simple dinner featuring a tempura vegetable type frozen prepared dish from Trader Joe's. [I posted this quite, on June 23, along with the entries for the next two days, so don't remember all the details.] We had just returned from two weekends and a full week in California, mostly in my favorite US city, San Francisco, and a few days visiting my brother in the Los Angeles area. Of course, we got great food! I was overdue for eating at my favorite restaurant, Millenium, and was able to introduce my wife to it (our hotel was literally a block or so away!!) - somehow we just had two and not more meals there, but they were scrumptious! The executive chef, Eric Tucker, knows me, and came out on both occasions to greet us. On the second occasion, we had a big group of friends and San Francisco Vegetarian Society members, including the owner of the restaurant! Somehow, I let today's and the next two day's postings slip by, so will just sketch a bit of what I remember. 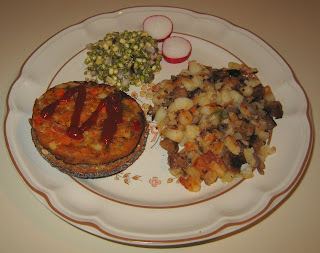 Today, on our first day back, I found we had some frozen hemp bagels, and used them to serve Indian vegetarian burgers from Trader Joe's. I also made some sort of a potato dish.